Holzwarth, Hans Werner. Koons. Cologne: Taschen, 2015, p. 75. Rothkopf, Scott [supervised by Bernard Blistène]. Jeff Koons: La Retrospective. France: Centre Pompidou, 2014, p. 189 (not exhibited). Koons, Jeff and Norman Rosenthal. Jeff Koons: Entretiens avec Norman Rosenthal. Hove, England: Thames & Hudson, 2014, p. 78 [French Edition]. Koons, Jeff and Norman Rosenthal. Jeff Koons: Conversations with Norman Rosenthal. China: Thames & Hudson, 2014, p. 78 [English Edition]. McCracken, Eric. 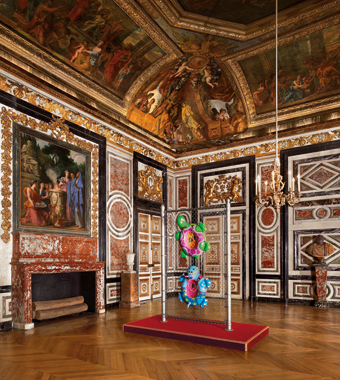 “Farm was before Fame for Koons.” York Sunday News [York, Pennsylvania] 11 April 2010, p. 5A (installation view, Château de Versailles, Versailles, 2008). Holzworth, Hans Werner, ed. Jeff Koons. Cologne, 2008, pp. 533, 580 (installation view), illustrated in color. Duncan, Michael. “LACMA Sizes Up.” Art in America May 2008, p. 68, illustrated in color. McCaughey, Patrick. "Taming the Monster." Apollo April 2008, p. 30 (installation view), illustrated in color. Politi, Giancarlo. "Jeff Koons: An Interview by the Readers of Flash Art." Flash Art (vol. 38, no. 240) January-February 2005, p. 88, illustrated in color. Woltmann, Marit, ed. Jeff Koons Retrospektiv. Exh. cat., Oslo: Astrup Fearnley Museet for Moderne Kunst, 2004, p. 117.